The Kimbell Art Museum is the youngest museum on Sister Wendy's tour. Opened in 1972, its approach to collecting and displaying art differs from most of the other collections highlighted in several ways. Based on the collection of Texas industrialist Kay Kimbell and his wife Velma, the Kimbell Art Museum embodies the goal to make a "small museum of supreme quality." Both the small size of the Kimbell collection -- works number in the hundreds, not the thousands -- and the building which houses it are remarkable. The founders' collection was based on examples of European and English 18th- and 19th-century works, mainly painting. They asked that later curators expand the range of the museum, setting a first criterion of high quality, rather than dictating encyclopedic collecting from any one genre, era, or geographic region. The museum has done this, by extending its range -- while keeping the size small -- to embrace landmark 20th-century art, as well as Asian, Pre-Columbian, and African art and antiquities from Egypt and the Near East. This collection of masterpieces is housed in a masterpiece of its own: architect Louis I. Kahn's 1972 building, one of the great museum buildings of the world. Among its innovations is the use of vaulted ceilings, which accommodate natural light. It is also celebrated for the elegance in which its simple materials, including copper and reinforced concrete, recall classical models. 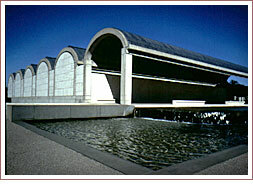 In 1990, the American Institute of Architects awarded the Kimbell Art Museum its 25 Year Award, for a building from 25 to 35 years old which "exemplifies design of enduring significance." The Kimbell Art Museum Web site, at www.kimbellart.org, includes a virtual tour of the galleries using QuickTime VR technology. A database of works in the collection, many with curator's notes and conservation information, is also available. Louis Kahn's biography, as well as images from other Kahn buildings, may be found on the site, as well.